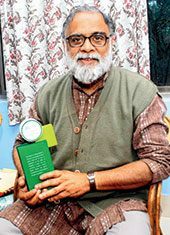 Jamshedpur (The Telegraph, Dec 8, 2008): A mentor in the steel city is leading the way to author a social entrepreneur’s bible in India. XLRI professor Madhukar Shukla, who heads the institute’s Fr Arrup Centre for Ecology and Sustainability (FACES), will team up with seven academics from across the nation to produce a teaching handbook on social entrepreneurship to guide faculties and students alike. Shukla, who was recently presented the Academic Contributor Award for 2011 by the Villgro Innovation Foundation and IIT-Madras’s Centre for Social Innovation and Entrepreneurship, conceptualised the handbook that the group aims to pen within six months. Shukla co-authors are Shambu Prasad of Xavier Institute of Management, Bhubaneswar; Harish Chaudhary of Faculty of Management Studies, Banaras Hindu University; Sourav Mukherjee of IIM-Bangalore; Ankur Sarin (IIM-Ahmedabad); P.K. Biswas, Indian Institute of Forest Management, Bhopal; Satyajit Majumdar, TISS, Mumbai, and Krishna Tanuku of Indian School of Business (ISB), Hyderabad. He explained that few dealt with social entrepreneurship as a subject in India. “There are many who would like to take up social entrepreneurship as a teaching course... As most of them tend to get no support, the teaching handbook has been planned to streamline issues and topics in the area for their benefit,” said Shukla, a faculty member of organisational behaviour and strategic management. The group of professors met at the Khemka Forum on Social Entrepreneurship at ISB-Hyderabad to discuss the initiative in November. The handbook will comprise guidelines for starters, besides an outline of related courses offered by institutes and professional bodies and classroom material such as case studies, articles, documentaries and research papers. “We will upload it on the Internet. It may also be given the shape of a social networking site or website. We may later publish hard copies,” Shukla said. This is one of the best institute that make the career of all the students who join this, Many MNC's placed the students studied by these colleges at very huge packs. These colleges always enroll hard working students.